Do you need curved stailifts! As stair lift experts, this blog will not only answer that question… but will give you an overview of what curved stairlifts are. Curved stairlifts are one of the most popular stairlifts in our range thanks to their versatility. As their name suggests, they are particularly suited to use on staircases that curve round or have corners. They run on a track that allows them to move smoothly around the curves without the user having to dismount. Of course, those with limited mobility can benefit greatly from stair lifts. Having either curved stair lifts or the straight type installed is very much dependent on the staircase. What both types remove is the everyday struggle and risk of getting up and down the stairs. Why are curved stairlifts more expensive than straight stairlifts? The difference in curved stairlift prices is simply because of the curved rail which the carriage travels on. Curves rails are specifically made to fit your existing staircase, whatever its shape or size. The benefits of a made-to-measure rail include a smoother ride, more space for other household members to move up and down the stairs and a perfect fit for your own personal needs. The number of curves required will increase the manufacturing costs for a bespoke curved rail. Power swivel seat to help the user mount/dismount versus a manual swivel. Folding footrest, arms and seat to reduce amount of room the stair lift takes up while not in use. Rail extensions, room permitted, to allow user to dismount the stair lift further away from top of stair case. Power hinged rails, allowing the top/bottom part of the stair lift rail to be folded away at the click of a button, reducing the dangers of trips and hazards. Lastly, choice of upholstery and trim finish. We hope this blog has been useful – of course you can give us a ring any time on 07880 734519 or 0115 07903 943 202 to arrange a free, no-obligation visit. Have a lovely day, Jon and Sarah. Members of the Erewash Partnership! 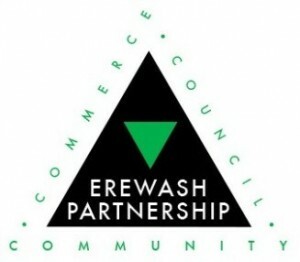 First of all, we’re really pleased to announce that we have just been accepted as members of the Erewash Partnership. This is a group of around 400 local businesses (called Associates). They are considered to be key in developing the local economy by supporting enterprise and regeneration. The company running this membership work very closely with Erewash Borough Council. Raising awareness of community projects, support events and charity work. In addition it supports the general well-being of the local community. As a result our membership allows us to work with other members to share business practice ideas. It gives advice and receives lots of training. Areas such as Emergency First Aid at Work and Safeguarding. Probably something we could all do with knowing a little bit more about! We also meet on a quarterly basis to network. After all, word of mouth is the best form of advertising. Furthermore, we’re happy to admit that most of our customers come recommended. We certainly know how to look after them that’s for sure! To become a member we had to apply and be questioned on our working practices. Especially relevant were our customer satisfaction, our trustworthiness and honesty. Also, in addition was how well we work with the local community. We were really overwhelmed with their decision and very proud to be accepted. This means we can now use the Erewash Partnership logo on our publications. This shows our customers that we’re a reputable business. We hope we will be given the opportunity to prove this to our new customers! So it all goes back to good old-fashioned customer service! Something we’ve always believed in and promised our customers. Just read some of our customer testimonials! You’ll get an idea of our working practices and beliefs. It sounds cheesy but our Priority is meeting yours! Jon and Sarah, Priority Lift Services Ltd.
We have put together a chairlifts Jargon buster in the hope of making stairlift terminology a little easier to understand. Below you’ll find the most common stairlift terms with explanations … we hope you find them useful! Straight Stairlift. The term “straight stairlift” refers to a stairlift unit and stairlift track which can be installed on straight staircases only. A straight staircase would start at the bottom and directly climb to the landing area or top of the stairs in a straight line. The stairlift track for a straight stairlift can be tailored made to the exact length of the staircase. Furthermore it can also be adapted to overcome obstacles. Most noteworthy of which are doorways near the bottom by the use of a hinge track system for example. Curved Stairlift. The term “Curved stairlift” refers to a stairlift unit and stairlift track that can be installed on staircases that feature corner/s or/and bends. The stairlift track can be tailored made to any configuration of staircase including multiple corners and bends. Stairlift Track. A stairlift track is fixed in most cases directly to the stairs and not the wall. The stairlift unit is then fixed upon the track enabling the stairlift to move up and down the stairs. Stairlift tracks are usually around 4-5” wide and are made from aluminium (straight) or steel (curved). The length depends on the size of your staircase. Powered / Manual Swivel Seat. A swivel seat is a device that enables the top half of the stairlift (where the user would sit) to be rotated away from the staircase so that the user is facing another direction. 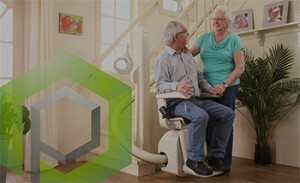 It’s designed to make getting on and off the stairlift easy and safe. Its main use is usually at the very top of the stairs for direct access to the landing area. They come in two options, manual and powered. Manual swivel seats are the standard option on most current stairlift models. Powered swivel seats are an upgraded feature. Width When Folded. The majority of stairlifts come with folding arms, seats and footrests. “Width when folded” measurements are to give the user an idea of how much room will be available on the stairs once the stairlift is folded away after use (arms, seat and footrest all folded together against the wall). Diagnostic Display. A diagnostic display is small digital display screen located on the stairlift. It displays current performance information. It enables the user to identify a problem with the stairlift via the handbook and also gives stairlift engineers a quick guide to any problems. 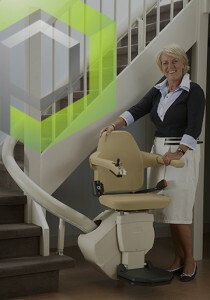 Most stairlifts now come fitted with a diagnostic display as standard. Weight Capacity chairlifts. This refers to the maximum user weight that the stairlift is able to carry up and down the stairs. AC Powered chairlifts. AC stands for Alternating Current and is commonly associated with older electric driven stairlifts. DC Powered chairlifts. DC stands for Direct Current meaning battery operated. The majority of today’s stairlifts are powered this way due to the many advantages over AC powered stairlifts. Toggle Controls / Joystick. Usually located on the stairlift arm, the toggle controls / joystick is a simple device that enables the user to operate the stairlift by lightly pressing left or right to control the direction up or down the stairs. Parking Points / Charging Points. Parking points are usually located at the top and bottom of the stairlift track where the user would end their journey and are a common feature on DC powered stairlifts. Charging points are usually fitted in the same place so that when the stairlift is parked either at the top or bottom, the stairlift batteries are charged automatically. Manual / Powered Hinge Track. Occasionally, the design of hallway and positioning of doors at the bottom of the stairs, means the stairlift is unable to park at the very bottom. A hinge track can overcome this problem as it’s designed so that the bottom part can be folded down when in use and up when not in use. They come in two options, powered and manual. Manual / Powered Footrest. Footrests are a standard feature on all stairlifts and offer support and comfort while travelling along the stairs and when alighting the stairlift. Manual footrests can be raised or lowered via the footrest handle, powered footrests can be operated by the press of a button and are automatically lowered and raised by a motor. Stand And Perch / Perched Stairlift. Ideal for users who cannot bend their knees to sit, the seat is higher and the user perches on the seat. This can also be an advantage on narrow stairs to stop the knees protruding out as far. Safety Edges. Safety edges stop the stairlift immediately if anything is blocking its progress along the stairs. This then enables the user to safely remove the obstruction. These are usually located around the footrest and stairlift carriage. Priority Lift Services stairlift training day. So yesterday, all our staff went on the latest Handicare training course for their Simplicity 950 straight stairlifts. They travelled from Derbyshire to their Head Office in Kingswinford, just outside of Birmingham. It’s a huge site! We found out that Handicare have just won a multi-million pound contract in America! So not only are they the UK’s biggest supplier… they are now setting their sights on the American market. Exciting news! 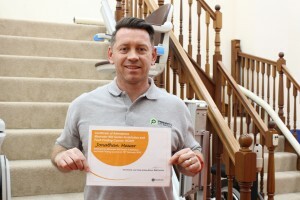 This new training gave us even more information on why Handicare stairlifts are so popular. They’re alot more compact and user-friendly than other well-known stairlifts. They’re much easier and quicker to repair (in the rare event that one breaks down) AND their customer service is second to none. One of the main reasons Handicare chose to work with Priority Lift Services, was due to us having the same dedication and commitment to our customers. What a great partnership! A large proportion of the training was about getting the customer moving again in as quickly a time as possible. Our staff were told which parts and spares to always carry in their vans – things like batteries, fuses, grease, cleaning products etc. 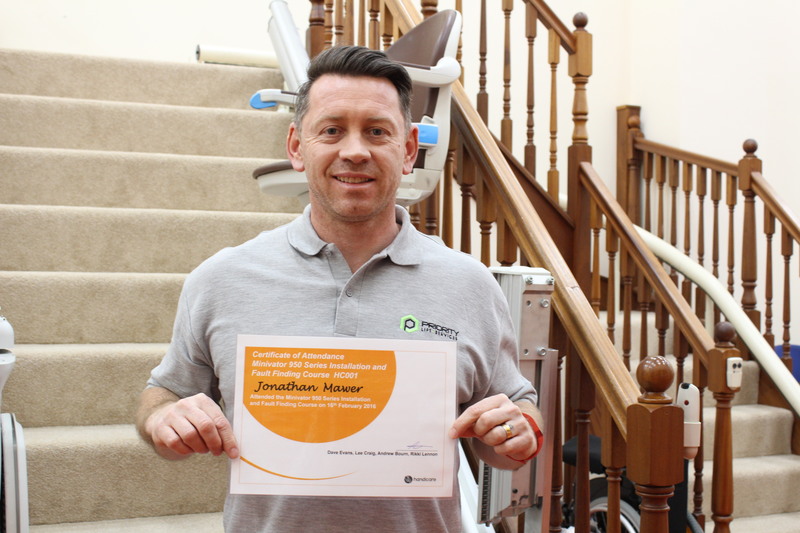 They also tested every one of our Engineers to ensure they were on top of their stair lift servicing – we’re pleased to say they all passed (as they always do!) and their certificates will take pride of place on their mantelpiece we’re sure! Our next refresher training is on Handicare’s curved stairlifts which are great for customers with a curved staircase (as the name suggests!). We love how the whole Handicare range is designed around all the different possibilities and requirements of individual customers. So after a quick pit stop at McDonalds on the way home, a training debrief this morning, it’s back out to work to ensure happy customers all round!